i have not tried white whisky yet. will do so, soon. thanks for post. i do like the balvenie brand. Go ahead… keep rubbing it! I tease of course. I need a Life 2.0 that is this fabulous! The Balvenie new make sounds fascinating. To be honest, I’ve haven’t had much in the way of new make spirit. Just a sample of that moonshine that they sell in mason jars. It wasn’t very good. Not straight at least. Regarding your tasting notes, I keep reading tasting notes from various writers and this “ester” word keeps popping up, and I have no clue what it means. I think I finally get what they mean by oaky, but “ester” escapes me. The other one I have trouble with is “resinous”. Think you could explain this further? When I think of esters, the only thing that comes to mind is Aunt Esther from Sanford & Son. Hahaha, you are HILARIOUS. Aunt Ester. As for the “blah blah’s” 🙂 …now you know why I HAD to start this blog! I’m so lucky that this really is my life (on the best of days) I needed to share these experiences with people who can appreciate this stuff! I may be able to help you understand “esters” as I’m confident you’ve experienced them before. There’s a wide range of ester notes that one can pull out of a spirit, but the most common association is “fruit” and it can range from the fruity “solvent” smell (think nail polish remover & really old bananas that have been left in a paper bag) to brighter versions of apples & pears on up to stone fruits. It still takes me a minute to properly identify them but doing tastings in the presence of skilled distillers has helped me with this immensely (not bragging at all but rather trying to give encouragement that I don’t think these are really “normal” things to say, “oh, this dram is a bit ester-y” so don’t get down if you struggle to identify them at first). By “resinous” I think this may be referring to the texture – perhaps used more for non-chill filtered spirits that have more oils & fats in them giving them a viscous feeling in the mouth. (I could really be wrong on this one and need to see how it is used but I think that may be what people are trying to say.) A good example is the Balcones products – he doesn’t do any chill-filtering and you can feel your mouth getting a nice coating of the whisky when you drink his products. So when a reviewer mentions pears, apples, pineapple, coconut etc., those are the different esters that they’re talking about? Maybe that’s why I rarely get those kind of notes or have difficulty understanding what they mean by this. When someone mentions those fruity notes, I take them literally and think of the fresh and fragrant variety of the fruit, i.e. a fresh cut pineapple etc.. As I’ve mentioned before, I’m still new to the nosing bit, but have definitely learned a lot over the past couple years. I need to attend more professionally run tastings! Now I’m wishing I had paid more attention in chemistry! But yes, from what I understand, these “esters” are the molecular compounds that are responsible for these distinctive fruit smells. We all know there is not actually “pineapple” or “banana” in the glass of whiskey – but I have certainly had my nose in a few glasses and had to concentrate really hard to get past these strong fruits smells. I too paid very little attention in chemistry class. I actually saw that link and glanced at it briefly. I will have to take a closer look. What I need to get my hands on is that whisky nosing kit that I have seen online. If only it weren’t $200! If the blog were an actual business, then I could probably write the cost off. Hmmm….. Fascinating tasting notes about Balvenie new make. What a fantastic opportunity to taste the new make. It gives a benchmark and perspective on what barrel aging really does. 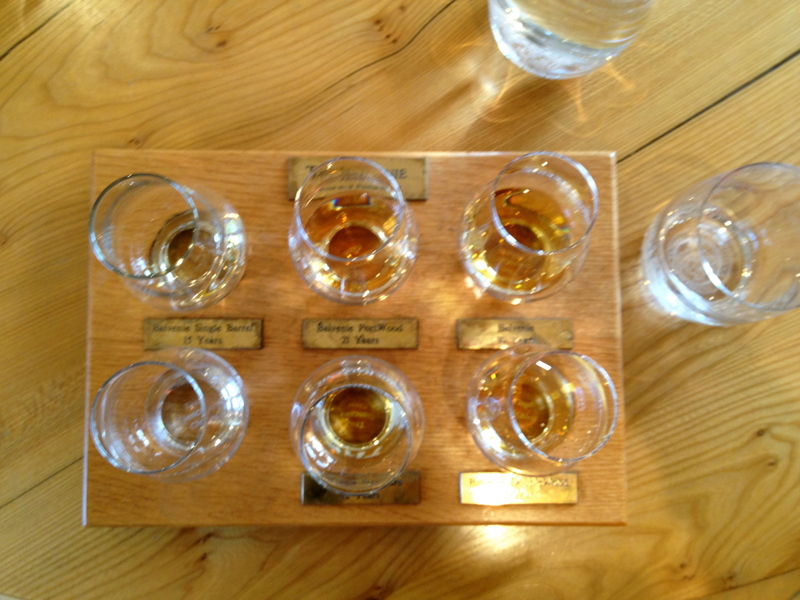 I wish I could taste the new make of every distillery I care about! Thanks so much for describing your experiences with it. I agree with you there – I wish we could taste the new makes of all of our favorite distilleries – it’s such a cool experience. I think of it as meeting a person throughout her life, the new makes are the crucial moments right after those tumultuous teenage years when you start to see this person with adult characteristics and can really begin to understand how she will grow, mature and come into her own. Thanks again – I always appreciate hearing your thoughts. I’ve been poking around the various whisky blogs and reading articles in magazines, and I have read on more than occasion about the dwindling inventory of old stock at most of the older distilleries. I wonder if this will lead to more new make spirit being released in the future. I think it would be super interesting to see distilleries like The Balvenie, Glenmorangie, Glenlivet, Ardbeg, etc. do some limited release new make bottlings every so often. I would definitely buy some! That’s a really interesting thought, G-LO. I could see them doing an occasional “new make” release though I wonder if Scottish law may not allow this … or perhaps they wouldn’t be able to call it “Scotch”? Just taking a wild guess here – I am not well versed in the laws regulating and governing the “Scotch” category. I believe you are correct, they wouldn’t be allowed to call it Scotch, much like Beam or Wild Turkey wouldn’t be allowed to sell unaged Bourbon as, well, Bourbon. But I’m sure they could find some creative way to market the stuff. I wonder if it would sell to anyone other than whisky geeks or avant garde bartenders. What if they went with Scottish or Kentucky Vodka? Now THAT might sell! Oh right, of course… (there was a chorus of “dugh’s” that just went off in my head) 😛 But I LOVE Scottish or Kentucky Vodka – now that’s some smart thinking! A bit of citrus — a wedge’s worth of lemon or lime — does tend to go well with new makes. It makes a bit of a fruit cocktail if the spirit has fruity notes, and covers up some of the unpleasantness if the spirit is more chemical tasting. In the U.S., at least, vodka is distilled at higher proof than whiskey, so “Kentucky Vodka” wouldn’t actually be vodka. Thank you so much for sharing your thoughts! I never thought about adding a wedge of citrus into a glass of un-aged whisky (I’m not creative in the kitchen or behind a bar … perhaps that’s why I’ve grown to love everything neat) 😛 I’ll certainly try that next time! I agree with you – if the price of new make is the same (or close enough) to the aged stuff, it’s quite hard for me to justify the purchase of the un-aged bottle. I’ve found a home away from home! What a lovely comment! Thank you so much. I checked out your blog too – Great stuff! 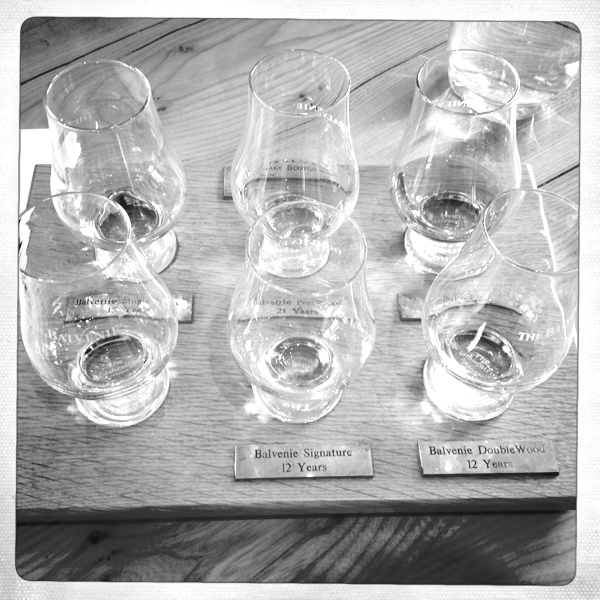 Looking forward to reading more & conversing with you in this cool whisky blogosphere! You are currently reading Balvenie – New Make Whisky Tasting Notes at The Whisky Woman.